Consider the lowly cassette tape. They started squeezing vinyl LPs out of the market in the 1970s. Then, a decade later, the tapes were muscled out by CDs. So, what ever happened to all those cassette tapes loaded with your favourite tunes? Thousands of them landed on the doorstep of Karen Jordon, the Ottawa artist who has never found any object too lowly to recycle. She even managed to turn human hair found in her shower drain into delicate sculptures. You would be amazed at the number of parts found in each cassette: strips of tape, the plastic cover, little wheels, screws, and other dainty bits. Individually, they are ho-hum. But when amassed by the thousands, you have the building blocks of intriguing art. 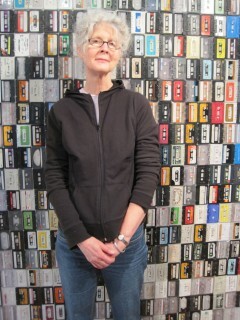 In the case of her most recent exhibit — Slow Dance, currently on view at Karsh-Masson Gallery — there are sculptures, mosaics, jewellery-like creations, and even a fragile-looking wall of the empty cassette tape plastic containers. There is no music playing in Karsh-Masson for this exhibition. Jordon has, after all, silenced the music previously recorded on these cassette tapes. However, the muted music does live on, on CDs. Even vinyl is making a comeback. Maybe Jordon should have kept these cassette tapes intact. When the next wave of nostalgia springs up for the 1970s, cassette tapes may once more be in vogue. Slow Dance. Until April 8 at Karsh-Masson Gallery, 136 St. Patrick St.